For years Ma-Ma had warned all her kooky Addams Family relatives that a UFO was coming to invade the city. She was so paranoid and convinced about this alien invasion, using her crystal ball she cast a protective spell on the Addams house, masking any signs of life forms living within. While moonbathing one night, Uncle Fester saw the aliens descend from the heavens and beam up all of the town's citizens save the Addams Family. Ma-Ma's spell had worked. 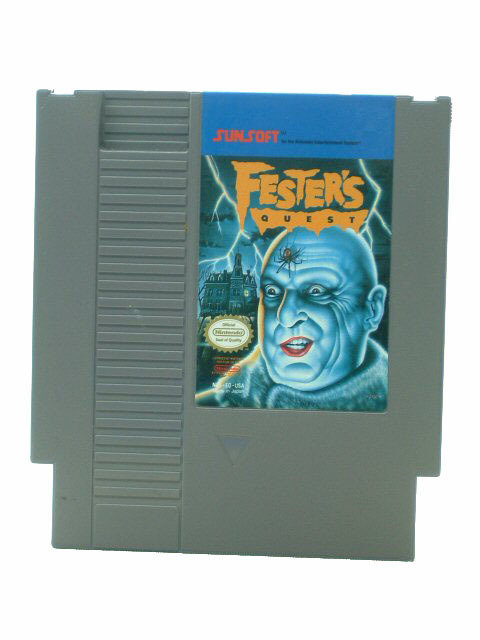 Armed with his gun and his wits, Fester took it upon himself to set out and rescue all of the townspeople. As Uncle Fester you must walk the streets, underground sewers, and various buildings, shooting aliens with your gun and attacking them with your whip. While on your quest, you'll visit seven different houses, each house inhabited by a member of your family. Upon admission, you'll receive an item such as a weapon or a potion to restore your health. Weapons include TNT, vice grips, invisible potion, missiles, and a noose. To enter the buildings, you'll need a key. Inside each building lies in wait an alien boss waiting to destroy you. The game is over when you have traversed all the levels and rescued all the townspeople, or when you run out of health energy.